Israel has threatened to annul press credentials of journalists and editors who use ‘contrary to reality’ headlines for their articles. The move comes in response to a publication from US broadcaster CBS after a terror attack in Jerusalem on Wednesday. CBS reacted to the terrorist attack which claimed the life of a 19-year-old female officer with a post titled “3 Palestinians killed as daily violence grinds on,” triggering outrage among Israeli officials. "'Three Palestinians killed as daily violence grinds on.' This is the headline that CBS chose to put on its website after the murderous terrorist attack near Damascus Gate in Jerusalem earlier today. We cannot ignore this. We will consider revoking the press credentials of journalists and editors who write headlines that are contrary to reality," said Nitzan Chen, Israel Government Press Director, in a statement on Facebook. Опубликовано Government Press Office 3 февраля 2016 г. Among those who denounced the headline was Tzipi Livni, former Israeli foreign minister, and leader of the Zionist Union party. The Israeli Ministry of Foreign Affairs also voiced its indignation over the controversial wording. "The audacity of CBS' headline is unparalleled. The headline is biased and false," commented Emmanuel Nahshon, the ministry's spokesman, Ynetnews daily reports. Border police officer Hadar Cohen, 19, and another female officer were critically wounded in an attack by three heavily armed men. Cohen later died in the hospital. Police managed to neutralize the attackers before they could detonate the explosives targeting civilians, according to security officials. Hadar Cohen (19) boarder policewoman, was killed on duty defending Jerusalem from Palestinian terror. Rest in Peace. The commander of the border police unit, who killed two of the assailants, said that he approached a group of suspicious-looking men wearing jackets and asked for their IDs. After that one of the men hit him with a gun and tried to shoot. As he turned around he saw an attacker stabbing a female officer and shot him. At the same time, a man was killed while attempting to fire at him. The third attacker was also killed at the scene by a police officer. The perpetrators were identified by Israeli police as Ahmed Abou Al-Roub, Mohammed Kameel and Ahmad Rajeh Ismail Zakarneh. All reportedly came from the West Bank. 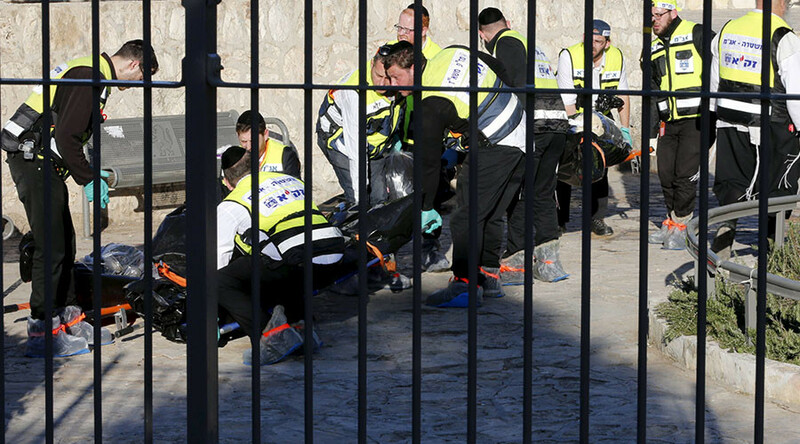 “As far as we can tell from the armaments, [the terrorists] planned a larger, more sophisticated attack,” Jerusalem Deputy Police Chief Avshalom Peled said, commenting on scale of the attack, the Times of Israel reported. Hamas, a Palestinian militant group, hailed the attackers, praising them as “heroes” and pointing out that the attack was a “severe blow” to Israeli security, according to the group’s spokesman Hussam Badran. The final headline was the result of a push by the Israeli Foreign Ministry, the Government Press Office and the National Information Directorate, according to Nahshon. Al Jazeera’s publication with a headline reading “Three Palestinians shot and killed by Israeli police at Damascus Gate in occupied East Jerusalem” was also given as an example of media bias in the GPO post.